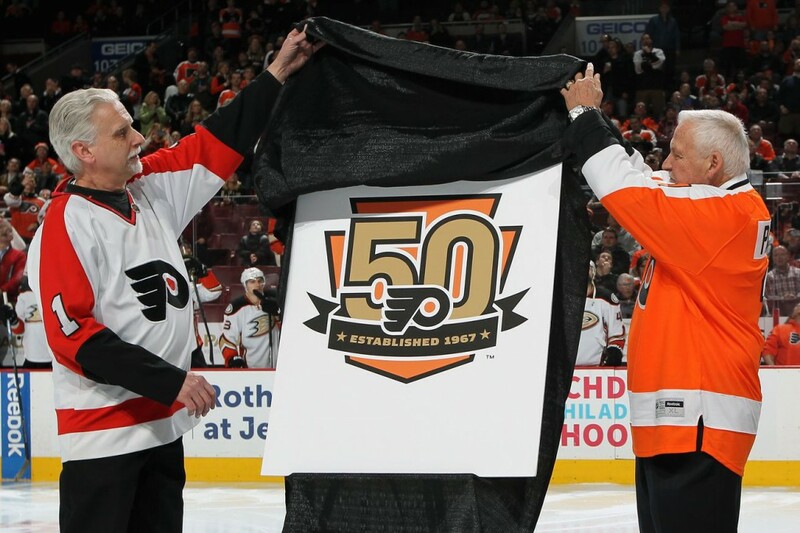 Philadelphia Flyers Celebrate 50th Anniversary – Commemorative logo by Hypno. It’s the 50th Anniversary for the Philadelphia Flyers! The Philadelphia Flyers were one of six hockey teams added as a major expansion of the National Hockey League for the 1967-68 Season, doubling the size of the league. Other teams added include the Pittsburgh Penguins, LA Kings, and St. Louis Blues, and two other teams that eventually moved, merged, or no longer exist. The Philadelphia Flyers commissioned Hypno Design to create their 50th Anniversary commemorative logo. 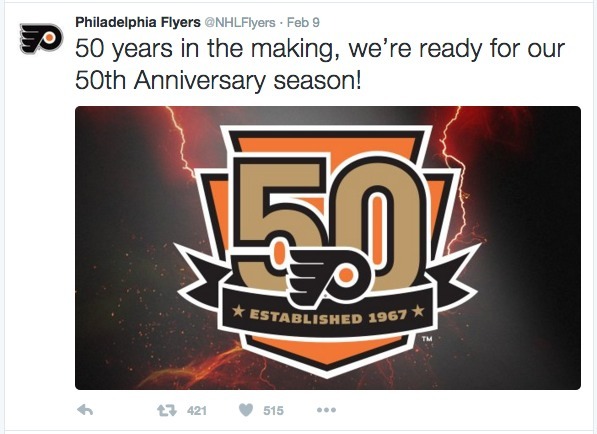 To celebrate their golden anniversary, the logo will be used throughout the 2016-17 season, on team jerseys, and throughout the Flyers’ branding and marketing. Other celebrations are planned as well! The Flyers have several “heritage nights” in 2016-17 planned, including: Captains Night, Tough Guys Night, Goalies Night and Playoff Heroes Night. And there will also be a Flyers vs. Penguins Alumni Game in 2017 at the Wells Fargo Center. 50th Anniversary Logos Commemorating the 4 remaining expansion teams. “It’s not every day you get to create something that will have historical significance, for a major and beloved national sports team. We’re proud of the anniversary logo and honored to have been chosen to work with the Flyers to help create it. It’s very exciting to know we’re a part of that history now too.” said Richard Cardona, Hypno Design’s creative director.